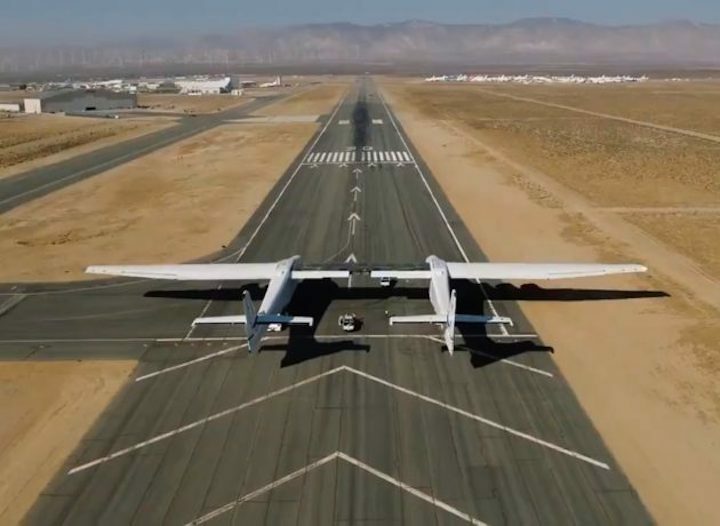 That’s one more not-so-small step for Stratolaunch’s giant airplane: The space venture’s founder, software billionaire Paul Allen, is showing off a 34-second video of the twin-fuselage aircraft as it aced its first taxi test on the runway at the Mojave Air and Space Port in California. Allen, one of Microsoft’s co-founders, created Stratolaunch six years ago as a follow-up to the SpaceShipOne private spaceflight venture he backed in Mojave. The program has gone through a series of strategic twists and turns, but the fact that the plane has begun rolling down the runway suggests it could start flight tests in earnest next year. Stratolaunch’s plane, nicknamed Roc, has the widest wingspan in the aviation world at 385 feet. That’s 50 percent wider than the wings of a Boeing 747 — which probably shouldn’t be surprising, considering that parts from two 747s went into building the plane. Mojave-based Scaled Composites aided in the fabrication of the plane’s carbon composite components. The plane is designed to carry one or more rockets to high altitude, then drop them in midflight for launch. The benefit of air launch is that satellite payloads could be sent into any orbital inclination from a wide range of locations. Orbital ATK is one of Stratolaunch’s partners, and U.S. governmental and military officials have sent signals that they might be interested in what Stratolaunch has to offer. If all goes according to plan, Stratolaunch could start launching by as early as 2019. And if there’s more to share on Monday, we’ll update this item. 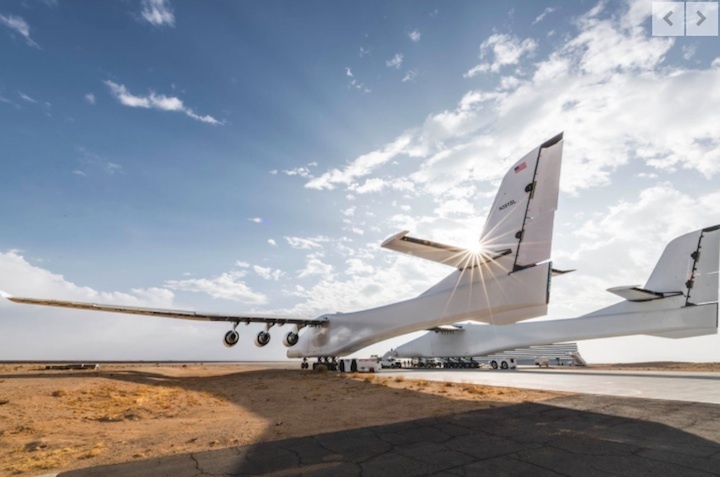 Eastern Kern County-based Scaled Composites has successfully executed a low speed taxi test of the Stratolaunch aircraft, the company said Monday in a news release. For the first time, the aircraft traveled down the runway under its own power, utilizing all six Pratt & Whitney turbofan engines. 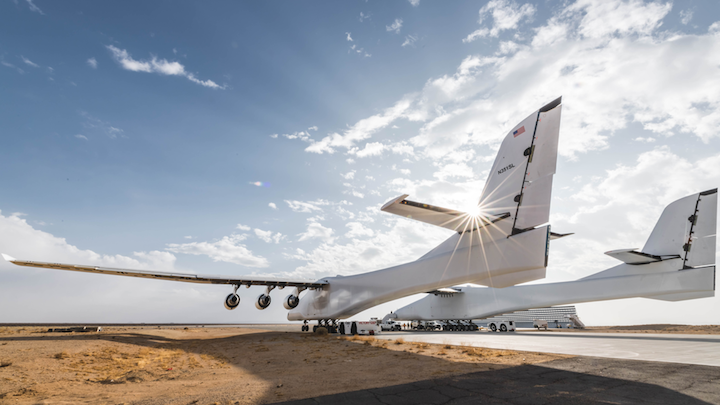 The world's largest airplane was designed and built at Mojave Air and Space Port to develop an air launch platform to make access to space more convenient, reliable, and routine. Saturday's initial taxi test was intended to demonstrate the fundamental ability to control the aircraft speed and direction on the runway. Joe Sweat, project pilot, talked about what it's like to move the world’s largest aircraft. "It was a lot less intimidating once we had it out there, in terms of how much runway we take up. From a visual standpoint, we had a lot more room than I was anticipating," he said. "Getting the airplane moving under its own power was really interesting — just seeing and feeling how the nose wheel steering reacts and how the brakes respond to the inputs." 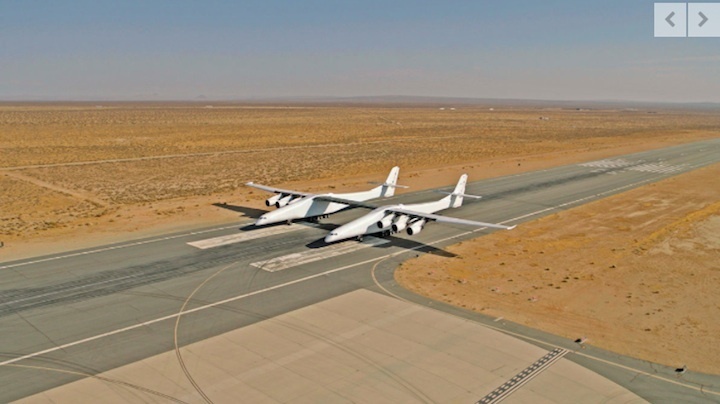 Scaled has been working with Stratolaunch for the past five years designing, building, and testing the giant aircraft. Microsoft co-founder and founder of Stratolaunch Paul Allen financed the endeavor. Scaled Composites is a specialty aerospace and composites development company offering design, build, and test capabilities. Founded by Burt Rutan in 1982 and located in Mojave, Scaled has averaged one first flight of a unique, new airplane per year. The taxi test was just one of many to come before the massive twin-fuselage bird takes flight. “Later taxi testing will include faster speeds and more challenging steering and braking tasks, all in preparation for first flight," Test Conductor Brandon Wood said in the release. "It was exciting to see this magnificent machine on the runway for the first time." The primary purpose of this activity was to test the aircraft’s ability to steer and stop. The ground team monitored a number of systems, including steering, braking, anti-skid and telemetry. The company reported that all systems operated as anticipated. "This was another exciting milestone for our team and the program," said George Bugg, aircraft program manager for Stratolaunch Systems Corp. "Our crew was able to demonstrate ground directional control with nose gear steering, and our brake systems were exercised successfully on the runway. Our first low speed taxi test is a very important step toward first flight. We are all proud and excited." Since the first engine runs in September, the team has performed a series of engine tests from the newly established Stratolaunch Mission Control Center, located at its facility at the space port, Stratolaunch CEO Jean Floyd said in a separate release. Mission Control serves as the hub for testing communications and will eventually be the center of the company's aircraft and launch operations. Once they have safely completed low-speed taxi tests, they will begin the next phase of taxi testing which will include increased speeds. 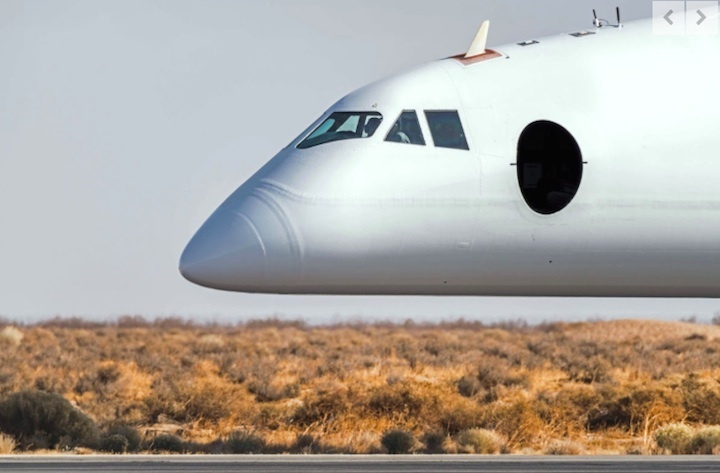 One of the many aerospace companies with operations near the Mojave Space Port has announced an important milestone in the development of what promises to be the world's largest aircraft. The Stratolaunch has a wingspan longer than a football field. The aircraft passed a road test Monday, taxiing around the runway, which tested it's ability to steer and stop. Up next, is another road test at higher speeds. The company hopes to get the aircraft in the sky next year. It's designed to carry satellites into low-earth orbit. The cargo would be stowed between the two fuselages using a model similar to that of Virgin Galactic's Space Ship Two, which is designed to carry people to the edge of space. The Stratolaunch, built by Stratolaunch Systems Corp., has six Boeing 747 engines and will carry a payload of more than 500,000 pounds.